Robert Kulp talking about his company Black Dog Salvage in Roanoke, VA.
Black Dog Salvage .blackdogsalvage.com is, as their brochure says, a treasury of antiques and architectural relics awaiting discovery. Robert Kulp and Mike Whiteside reclaim and renew/ repurpose salvage. That it is their passion is evident as I wandered around the huge 40,000 sq foot warehouse. They have been at it since 1999 and have a ½ hour TV show on Netflix, now in it’s 5th season, showing the demolition and the repurposing of great finds. The idea of reclaiming buildings and items that no longer can function as originally made is not only blossoming in this country but I’ve seen it in Europe and Asia as well. One of Jake Cress’ pieces of animated wood furniture. Note the crutch as one of the legs. The next day we headed out to the rolling hills of Botetourt County just north of Roanoke. 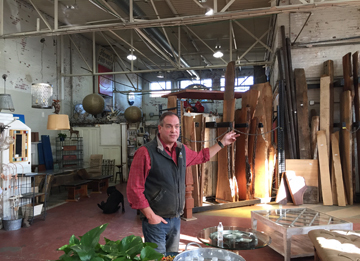 We visited several painters and craftsmen including oil painter Mark Young, Kevin Riddle woodworker and coppersmithing, printmaker Ed Bordett, wood turner Willie Simmons and Jake Cress, master craftsman of animated wood furniture.